Upon entering the glass street-level exhibition space of the Kunsthalle Bratislava LAB to view the exhibition of Michel Houellebecq’s photography, a gallery attendant approaches, with exhibition reading materials in hand dubiously state dramatically ironic information: the artist’s images are unrelated to his literature. She adds, on a personal note, that she has not read any of Houellebecq’s novels but, informs visitors she had been told his novels are “very good” and after having spent many hours in this exhibition, she plans to read him. This information presents the visitor not so much with a Catch-22, as with the opportunity to knowingly ignore normative instructions. As such, the welcome into Houellebecq’s exhibition confronts us with a recurring conflict: to address forbiddingness and the natural. Yet, the photographs on view are in fact made by the notorious novelist and poet. The exhibition text reminds the visitor that Houellebecq is “one of the contemporary authors of French language, who is the most translated and read in the world.” This is the author who has been coined ‘the supermarket Baudelaire.’1 It is acknowledged that Houellebecq’s fame is the result of his literary career—this is the reason for the interest in his work, is it not? One is interested in how this complicated writer engages visual language; it is not possible to disremember his work in viewing the photographs—despite the gallery assistant’s instructions, the exhibition is accompanied by an excerpt of Houellebecq’s 1992 essay Approches du Désarroi (Approaches to Disarray), which in this context functions quite like a manifesto. All this being the case, the photographs are visually engrossing and perplexing. Indeed, they do not need to be tied to the literature of their maker in order to be stimulating. 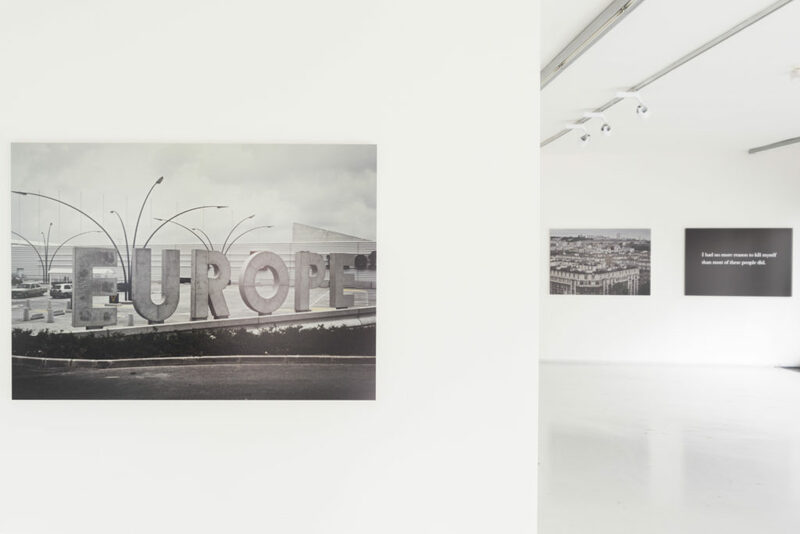 Michel Houellebecq, exhibition view of Michel Houellebecq, May 18–June 24, 2018, Kunsthalle Bratislava. Courtesy of the artist and Kunsthalle Bratislava. Photo Credit: Adam Škavoý. The photographs are depopulated, focusing not on individuals, but instead on landscapes, architecture, and the interaction of human civilization in nature. There are streets and street signs directing motor vehicles, yet no vehicles are depicted—only the clouds in the sky behind the trees are active. Houellebecq uses digital and analog cameras, manipulating some images—heightening the blues and greens to levels that objectify nature in relation to the manmade. We see photos taken from great heights and broad views made to capture the largeness of his subject. One photograph shows a mass of social housing buildings in a suburban district with the words “Avallon suburbs 1.” In another, there is a sculpted cow on a derelict sign advertising a weekend farmer’s market that is defunct. Some photographs are titled in a numbered system (e.g. France #X, or Inscriptions #X); these have coherent phrases seemingly photoshopped onto the photograph. The work is anti-utopian but also adoring. Though the images depict France as the stand-in for all continuously changing Western countries, the photographs are remarkably anti-nostalgic. They are candid investigations of the place where the city meets the country. Reading the accompanying texts further, we are informed that the photographs do carry a relation to the poetry of the artist. In the re-print of a conversation between Houellebecq and Jean de Loisy, from the catalogue of the Palais de Tokyo 2016 exhibition Rester Vivant (To Stay Alive)—the same title shared by his new film project with Iggy Pop—Houellebecq says about poetry and photography: “Yes, there is a relationship, but I do not know exactly what it is.” Following, Houellebecq states that although he “expresses feelings” in poetry, his photography is absent of emotion. Houellebecq’s use of the first-person narrative in his writings has welcomed broad critical analysis of his person in regard to his novels. Yet, in his photography, this first-person narrative comes even closer at hand, as it is Houellebecq who looks through the camera to shoot the image. While a list of politically incorrect self-descriptions has come out in interviews when he is questioned about his moral intentions, and whether the narrators of his novels truly speak for him, his truest public “I” is in fact made visible in the photography. The works both cherish that which they capture and remain indifferent to any societal abrasion they depict. 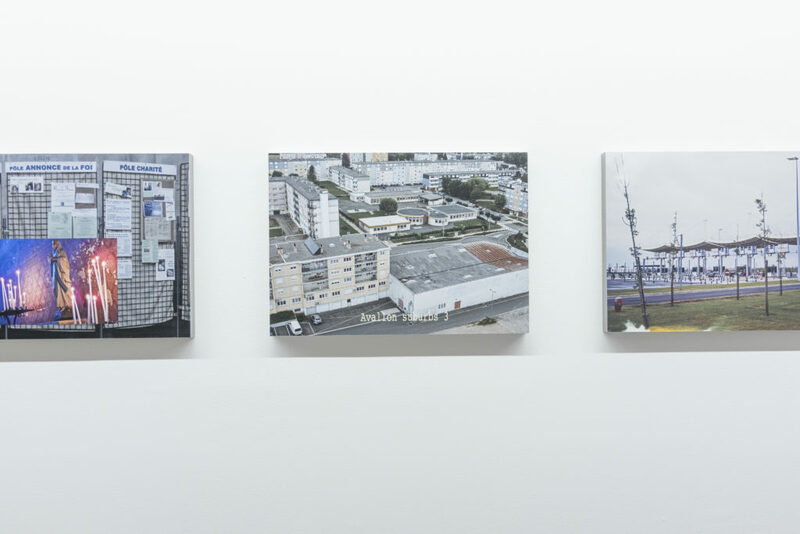 In line with Houellebecq’s photographic intentions, the exhibition maintains a book tour-like presentation in that many of the works on view already have been exhibited in, frankly, prominent art world settings—namely the French Bashing at Venus Over Manhattan in 2017 and Rester Vivant at Palais de Tokyo in 2016. This re-presentation of work accords the exhibition with the condition of marketing, affirming an openness to the capitalist economics that is often a major undercurrent in Houellebecq’s literary achievements. Presenting the visitor with the confrontation that any expectation of a new exhibition by Houellebecq, this show reflects one’s commercially cultivated expectations—one where the artist affords the opportunity to elevate his own work through the curatorial practices of others. 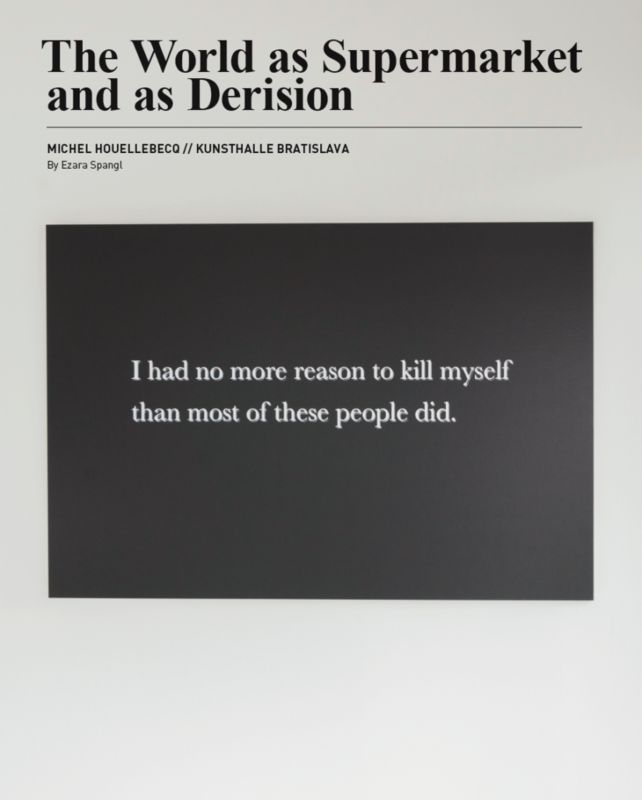 Michel Houellebecq ran at Kunsthalle Bratislava LAB from May 18–June 24, 2018. 1 Glad, Vincent. “Michel Houellebecq Borrowed from Wikipedia. Is He in Trouble?” Slate Magazine. September 10, 2010. September 26, 2018 | Filed under Art Seen: International.